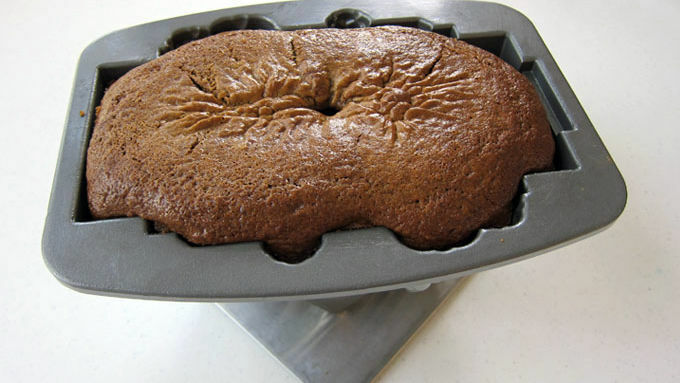 Spray gingerbread cake pan with non-stick baking spray with flour. Combine Betty Crocker™ gingerbread cake and cookie mix, water and eggs in a large mixing bowl. Beat on low speed for 30 seconds then increase speed to medium and continue to beat for 1 1/2 minutes. Remove 1 cup of batter and reserve for another use. Pour remaining batter in the cake pan. Set pan in oven and set a baking pan on the rack below the cake in case the cake spills over. Bake for 55-65 minutes. Remove and cool for 10 minutes. Cut off the domed part of the cake. Set a cooling rack over the opening of the pan, invert, and allow the cake to release from the pan. Remove the pan and allow the cake to cool completely before decorating. 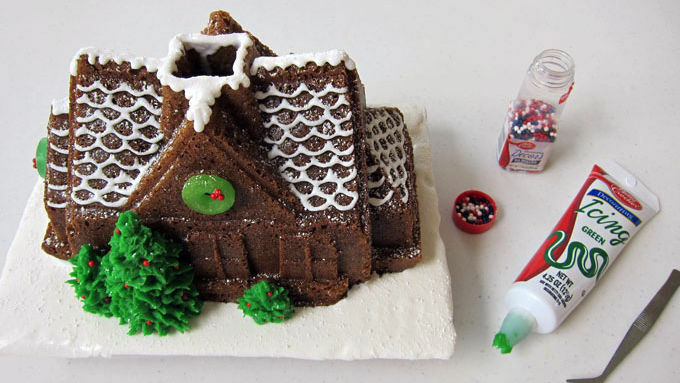 Use white cookie icing to decorate the shingles and roofline of the gingerbread house. Use green decorating icing to decorate trees. Add some red candy pearls to each of the trees. Add three candy pearls to each of the green ring candies to create wreaths. Attach wreaths to gingerbread house using white cookie icing. Sprinkle powdered sugar over house. 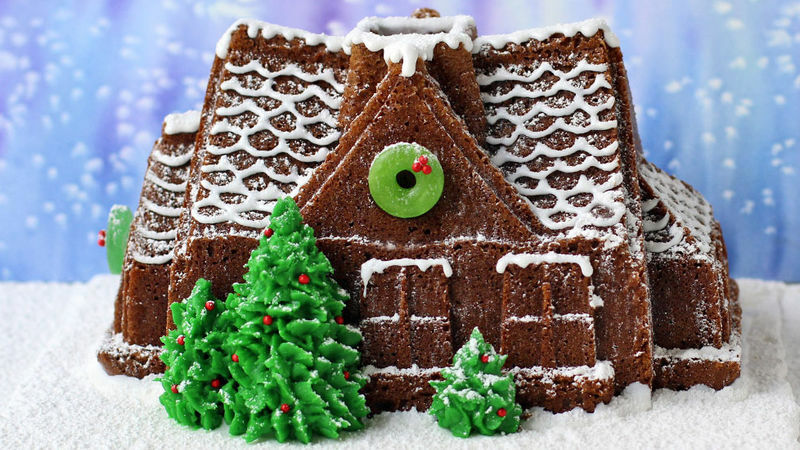 If you love the look of a gingerbread house but hate all the work, this dessert is for you! 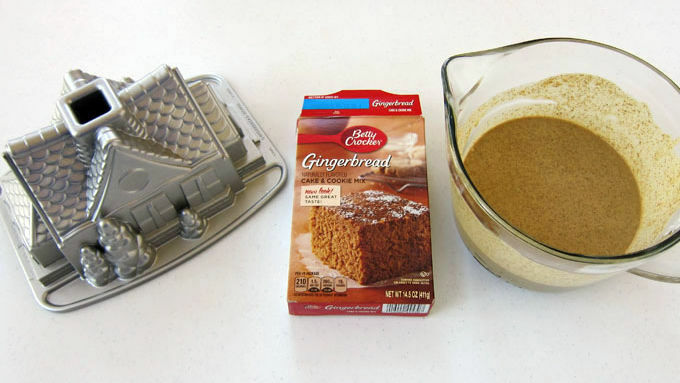 Instead of painstakingly baking cookies and cutting them to assemble into a sturdy house, all you have to do is whip up two Betty Crocker™ Gingerbread Cake mixes and bake them in a 3-D gingerbread cake pan. The gingerbread house cake has so much detail that you can just serve the cake plain, but it's more fun to add some decorations! Just like with any gingerbread house, you can get as creative as you want when decorating. Add Betty Crocker™ icing, decors, and some candy to create a simple festive treat, or really go all out and create a more elaborately decorated house. The choice is yours! This house is simple, elegant, snow-covered—and was super simple to make. 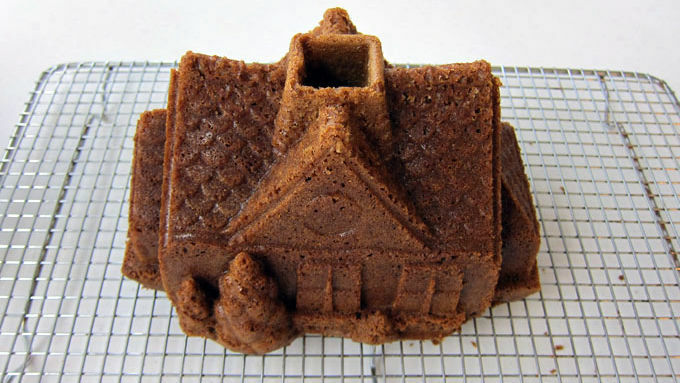 In order to make this gingerbread house cake, you'll need a gingerbread house cake pan. Even though it's non-stick, it's best to brush it with shortening and dust it with flour. Or simply spray it with some baking spray that has flour in it before baking your cake. When using the two cake mixes for this recipe, you’ll have just a bit more cake batter than you need to fill the pan, so remove 1 cup of the batter and use it to make a few cupcakes to snack on. Pour the remaining batter in the pan and set the pan in the oven. Set a baking pan on the rack below the cake, just in case the batter overflows the pan. There is a hole in the center of the pan to allow excess batter to seep out of the bottom of the pan. Do as much or as little as you'd like to your cake. Set the cake on a serving platter or a cake board covered in white cookie icing. You can pipe shingles onto the roof of the gingerbread house. Add some icing snow to the roofline. If you'd like to add some wreaths above the doors, use some green ring candies, attach a few red candy pearls using cookie icing, then attach the wreaths to the cake using more cookie icing. Then you can pipe some green frosting onto the trees, add some red candy pearls, and sprinkle some powdered sugar snow over top. This gingerbread cake will look just as good on your holiday table as the house you cleaned for days. Happy Holidays!